America’s youngest state, Hawaii, isn’t known for making Texas-sized boasts about its greatness, or for aggressively pushing its brand on its neighbors, the way that, say, Florida and California do. Yet Hawaii may have the strongest sense of identity of any U.S. state—a fierce cultural pride and feeling of exceptionalism that flow from its unique island heritage. 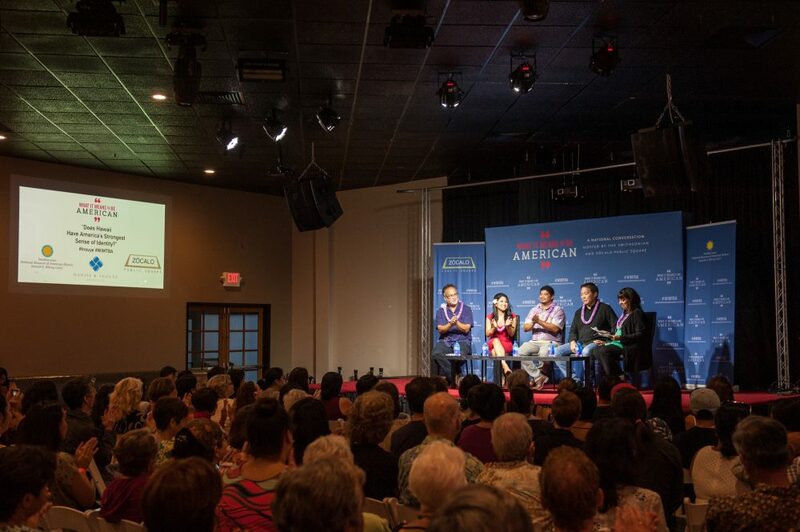 That was the premise of a Smithsonian/Zócalo “What It Means to Be American” panel discussion, supported by the Daniel K. Inouye Institute, before a packed audience at Artistry Honolulu. 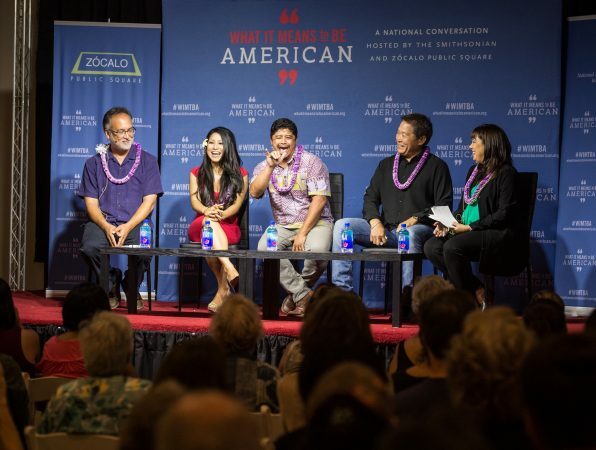 And when moderator Lee Cataluna, a metro columnist for The Honolulu Star-Advertiser, launched the conversation by asking whether the assumption about Hawaii’s staunch sense of selfhood was correct, four hands shot up in agreement. One of those hands belonged to Lawrence Downes, a journalist and former editorial board member of The New York Times. “No offense to Delaware or North Dakota,” Downes said, but Hawaii possesses a degree of self-awareness and communal feeling that sets it apart from the Lower 48. “Only in Hawaii do we have pretty much everything in common,” Downes said—the shared sensation of swimming in warm Pacific waters, or the exchanging of the familiar Hawaii “gang sign” (a signature hand signal). Small signifiers give away someone’s Hawaii identity, especially to other people from Hawaii, said singer and American Idol finalist Jasmine Trias. She said she didn’t fully appreciate these social cues until she moved to California to compete in the popular TV talent-contest show. “It’s like an unspoken thing that we can’t really explain, that only we can understand,” Trias said. It’s hard to fully appreciate paradise when you’re born into it, she added. 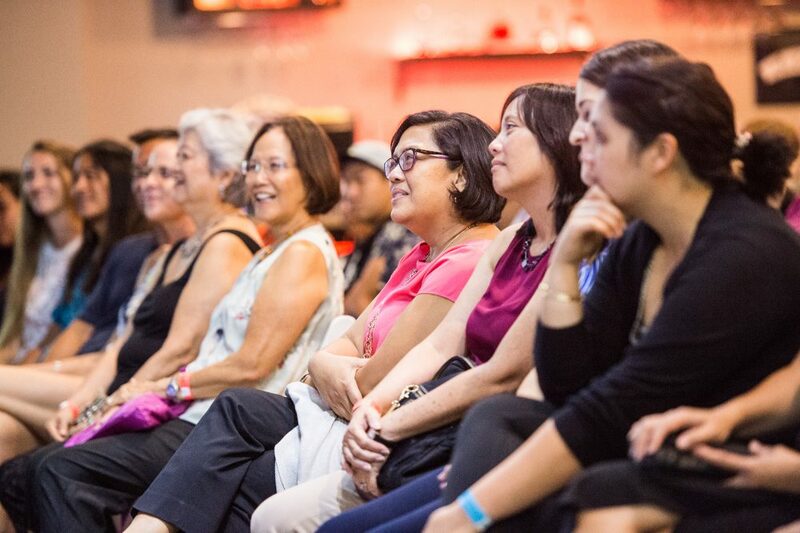 What attracts mainlanders to people from Hawaii, Cataluna asked? “I think we have the Hawaii charm, the Aloha spirit,” Trias said. “We wear our hearts on our sleeve, and that’s our identity.” The concept of ohana—meaning a kind of extended family that embraces practically all humanity—also endears people from the island to those they meet when traveling. 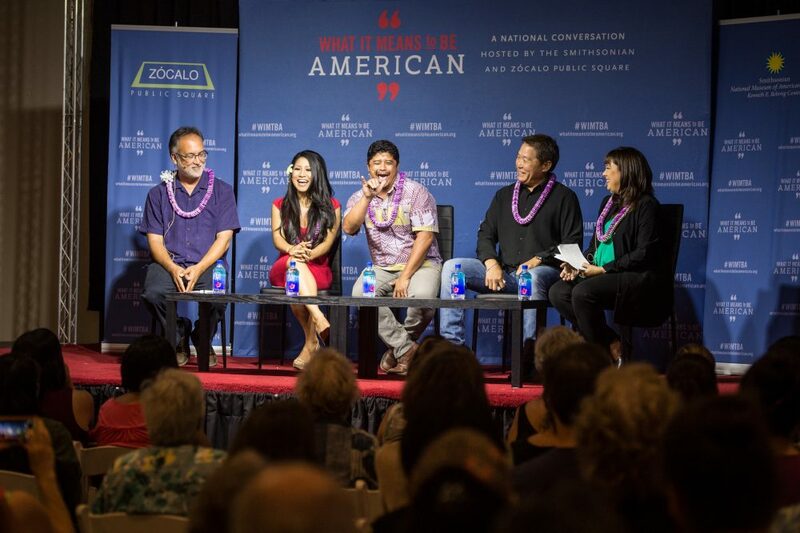 The discussion was punctuated by moments of poignancy and bursts of raucous humor, in no small part because of panelist Augie T., a comedian who has been named the Aloha State’s funniest comic by The Honolulu Star-Bulletin. Now that he’s regularly performing stateside, Augie T. said, his audiences often consist of ex-pats from Hawaii, who show up at his venues playing up their Hawaii-ness and who get all his Hawaii in-jokes—even in places like Boston and Evansville, Indiana. 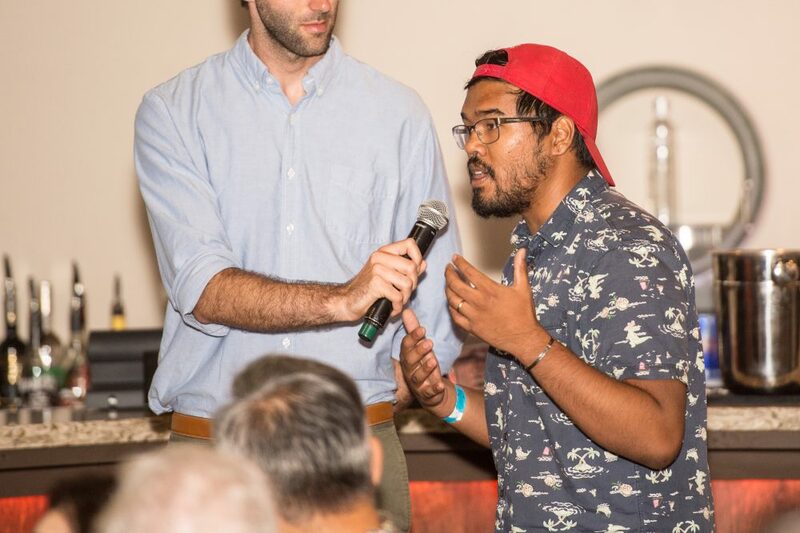 “It’s amazing that you can go to any place and find one local person, and there’s an automatic connection,” he said. Augie T., whose ancestors migrated from the Philippines and Portgual, suggested that he gets a pass on making jokes laced with Hawaiian ethnic humor because islanders are comfortable with their own polyglot, poly-ethnic peculiarities, and don’t take offense when this humor is self-directed (or self-inflicted). “If Augie is having a good time, you’re having a good time!” he said. 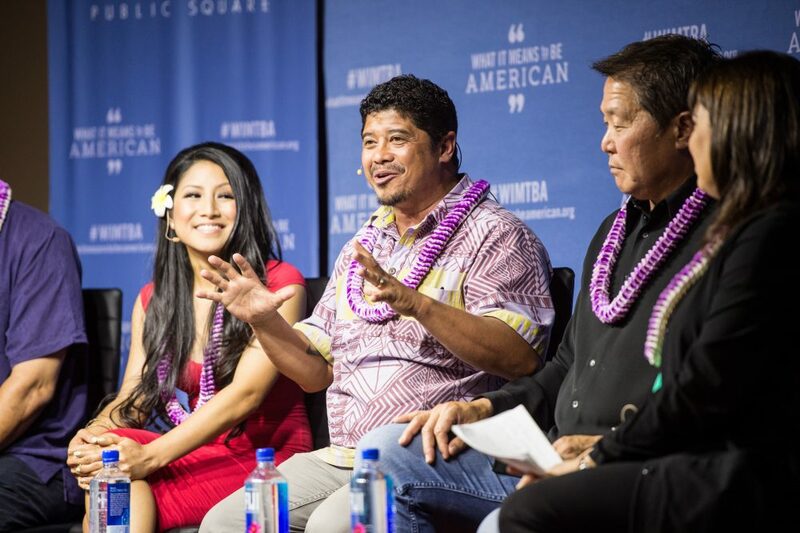 Later in the evening, the conversation took on a more philosophical and subdued tone, as panelists acknowledged that shifting economic winds and globalization are eroding some of Hawaii’s distinctive features. 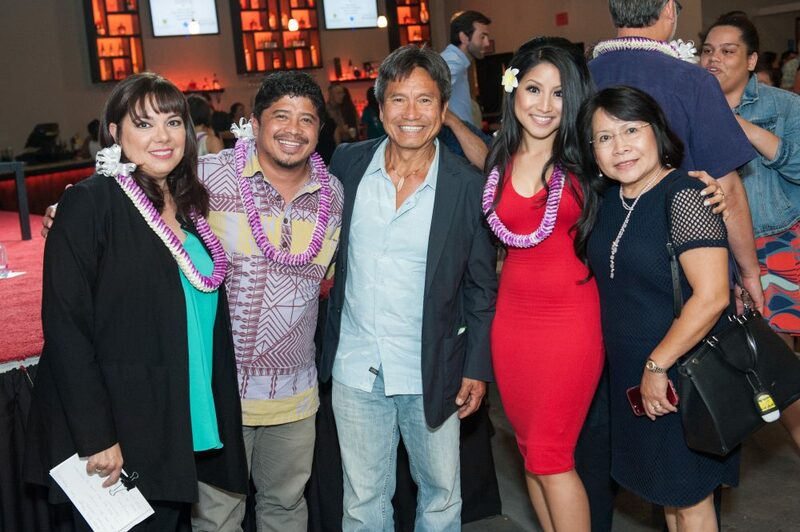 Kurt Osaki, a graphic designer and founder of Osaki Creative Group, left Hawaii as a young man to study at Art Center College of Design in Pasadena. He went on to create brands for Fortune 500 clients, including the NFL’s Tampa Bay Buccaneers and New York Jets. Osaki said that he doesn’t wear Aloha shirts much anymore, but still feels his Hawaii-ness in other rituals, such as bringing food to potluck parties (in the Hawaii communal spirit) and not wearing shoes indoors. Downes, who moved away from Kailua to attend college at New York’s Fordham University in 1982, said that much of what Hawaii shares comes from plantation culture, from people recognizing each other’s common ancestral roots in Okinawa or Polynesia. Despite the idea of a shared identity, islanders themselves are acutely aware of the distinctions between native Hawaiian people and so-called Hawaii residents. Today, some of those derelict plantations have become homeless encampments. Pidgin dialect—another relic of plantation culture—is creeping slowly toward possible extinction. As people from Hawaii move to places like Las Vegas, or to attend college in Oregon or California, their native identity may dissolve. Downes said that one of the first stories he wrote for The New York Times was about folks who’d moved from Hawaii to Las Vegas. Among those he profiled was a lifeguard, who instead of bounding around in massive Pacific swells had been reduced to keeping watch on a “wave pool” at a Vegas hotel. But those familiar bonds were plain to see as the evening wrapped up, and Trias led the traditional rendition of “Hawaii Aloha,” with its invocation of a beautiful and blessed “native home.” The entire room joined hands, locals and out-of-town guests, natives and residents, singing and swaying as one. This is part of What It Means to Be American, a partnership of the Smithsonian’s National Museum of American History and Zócalo Public Square. A full house at the Artistry Honolulu. 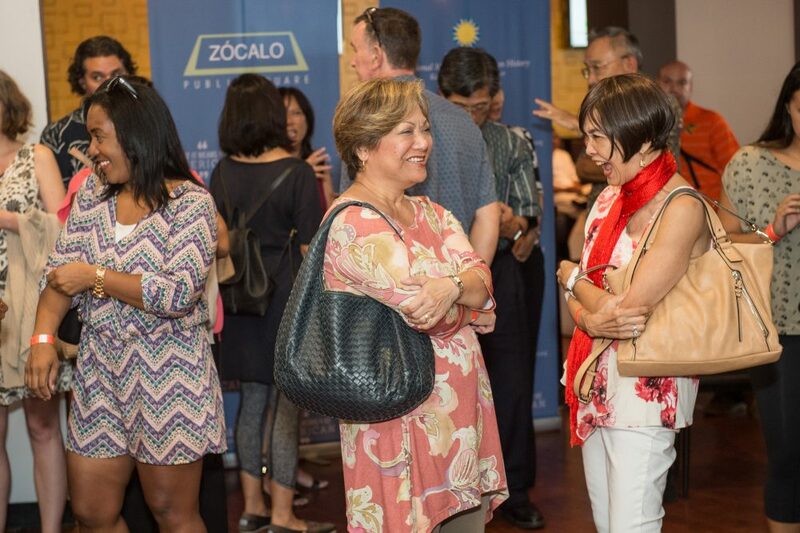 Lee Cataluna, Augie T., and Jasmine Trias meet guests at the reception.